John here--I took a picture of these folks yesterday and thought I'd share it with you and see what you thought. Is it just me, or should there be some traffic rules about where "panhandlers" or whatever you want to call them, can set up shop? 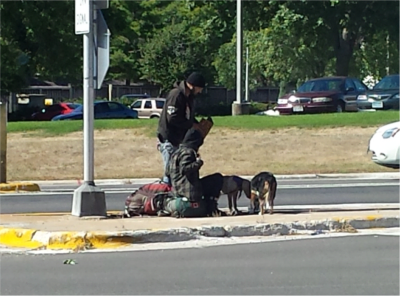 While I was waiting at the lights by the mall where Highways 16 and 157 meet, these two and their dogs just walked right out onto the concrete median at one of the busiest intersections in the area, sat down and started soliciting drivers for money. I'm not ripping on those less fortunate than me who have no other option but to panhandle, but shouldn't there be some limits to where they can do it? What if one of them accidentally steps in front of a car and gets hit? What if one of their dogs runs into traffic and gets run over? What do you think, should those who need to panhandle be allowed to do it any way they want because they are less fortunate? Do you ever give money to these people? Love to hear your thoughts: johnandjacklyn@kicks1063.com. Also note I didn't use the word "beg" or "beggars". Wouldn't want to be considered "insenitive"!